Ajinkya Foundation was set up in 2002, to address the needs of mentally handicapped children in Sangli. It is the only organisation that provides any noteworthy rehabilitative care for such children in the area. Besides providing therapy, the Foundation has also begun sensitizing the surrounding population to the needs of the mentally handicapped, and is trying to alleviate social stigmas through awareness programs and self-help groups. Currently, Ajinkya Foundation reaches out to 40 children, and is in the process of constructing a residential rehabilitation centre for the mentally handicapped at Kupwad, near Sangli. Increase in Income: Ajinkya Foundation’s main source of income is from individual donors (Ref: Fig.1). Income from this source amounted to Rs0.62mn in FY13, an increase of 56% over FY12. The increase is attributable to the registration granted to Ajinkya Foundation under section 35AC by the Income-tax Department in FY12 for all donations made towards their rehabilitation centre (100% deduction), which is currently under construction. The other main sources of income are corporate and institutional donors, which contributed about 22% each to the total income in FY13, and have been on a steady but modest growth path over the past few years. Program Expenses vs. Overheads: Approximately 66% of the Foundation’s expenses were incurred through direct program activities (Ref: Fig.2), mainly towards salaries of program staff and remuneration to consulting medical practitioners. Ajinkya Foundation does not currently have any administrative staff, and does not incur any cost on fundraising activities. Expenses on overheads amounted to approximately 26% of all expenses in FY13, which mainly comprises rent, repairs, maintenance and other general utilities. Income Growth Rate (IGR): The IGR of Ajinkya Foundation has been just about 26% on an average over the past 3 years, although there has been no clear trend in this ratio. The Foundation does face challenges in fundraising, as a result of which the IGR has been fluctuating. However, with the recent 35AC registration, the Foundation can hope to have a dependable inflow of funds over the next few years. Self Sufficiency Ratio (SSR): The SSR ratio has been improving over the years, and rose to 62% in FY13 from 37% in FY10. This is due to the hike in funding from individual donors in FY13. The SSR ratio measures the how much of expenses can be met from own income – individual donations/corpus income/fee income. 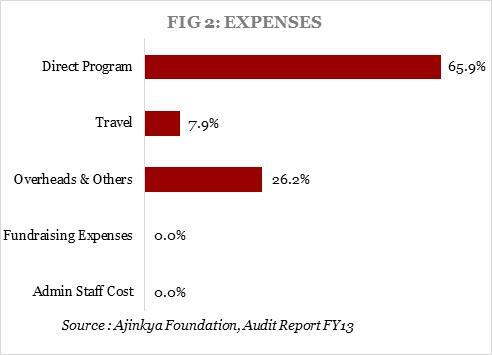 Inadequate Funding: Ajinkya Foundation experiences challenges when it comes to raising funds to support its initiatives, due to its location and consequent lack of ease in connectivity to donors. The size of the team is also small, being primarily run by the founders who currently focus more on the implementation of the program and do not have the resources to pursue fundraising separately. Perhaps the nature of its program itself, i.e. rehabilitation of the mentally handicapped, also plays a role in this challenge, as it is not an obvious first choice for support by donors, and also does not immediately generate calculable progress among the beneficiaries. The lack of funding has resulted in the stalling of construction of the rehabilitation centre; although Ajinkya Foundation receives free architectural consulting from a group of benefactors, it is still unable to raise the Rs26mn required to complete the project. Lack of Government Support: The Foundation also experiences challenges from Government officials in the area, either through lack of co-operation or through artificial bureaucratic hurdles. Ajinkya Foundation is primarily run by its founding trustees, Ashok and Shailaja Goudaje, who started the NGO after a personal tragic experience with mental retardation in their family. Shailaja Goudaje underwent training on rehabilitative care for mentally handicapped children, and started in the first centre at their home. She was later joined in the effort full-time by her husband Ashok Goudaje, who now functions as managing trustee, in the operations and scaling-up of the program.